SynGlycTis was a Europe-wide consortium (2014-2018) funded under the first joint call of the ERASynBio Initiative. Methods developed by the SynGlycTis consortium will be exploited in the synBIOcarb project. The creation of artificial cell-like structures (protocells) has diverse applications from carriers for drug delivery to simple models for probing the origins of life. 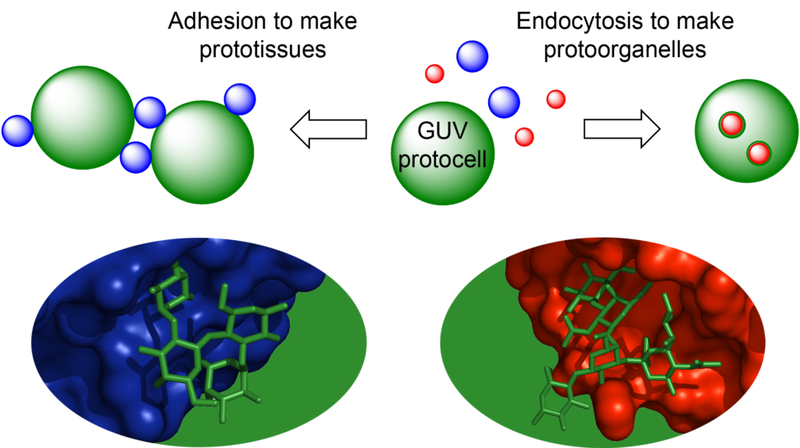 Great advances have been made in this sub-field of synthetic biology through the development of proto-cells based on giant unilamellar vesicles (GUVs). However, one essential functional element of all living cells that has been largely overlooked in such systems is a glycocalyx. This coating of complex carbohydrates extends up to 100 nm from the cell membrane and provides an adhesive layer that mediates interactions between different cell types, viruses and signalling molecules. In most cases, these interactions involve specific carbohydrate-binding proteins (lectins), which may be either soluble or membrane-bound. For example, fertilisation is initiated by a specific carbohydrate on the surface of the egg adhering to a specific lectin on the head of the sperm. Protein-carbohydrate interactions also mediate the endocytosis of many bacteria, viruses and bacterial toxins which bind to specific glycolipids on the cell membrane. Protein-carbohydrate interactions thus present a general strategy for enabling cell adhesion and cell entry. The aim of the SynGlycTis project was to introduce the principles of glycoscience to synthetic biology. In doing so, we aimed to create a modular toolbox of synthetic glycocalyx components and reengineered lectins that would allow us to recreate complex cellular phenomena including cellular adhesion, endocytosis and membrane fusion. The creation of artificial “prototissues” is anticipated to have future applications in regenerative medicine in which artificial tissues can interface with living tissues. The recreation of endocytic or fusion phenomena would provide smart drug delivery systems. While re-engineering the binding specificities of the lectins would provide tools for medical diagnostics. In the project, we have developed methods to tune the binding selectivity of individual lectins through the incorporation of unnatural amino acids. By expanding the chemical diversity of the amino acid building blocks at specific sites in lectins we have been able to change the affinities of the lectins and also incorporate unique reactive groups for site-specific modification of the proteins. These innovations will enable us to optimise the lectins for incorporation into diagnostic devices. We have also developed a robust modular approach for the construction of complex, yet well-defined glycocalyxes on vesicles and supported membranes. The strategy we have implemented is to use multiple bioorthogonal ligation reactions to build fluorescent glycopeptides with cholesterol-based tails to anchor the glyco-modules into GUV membranes. Through this strategy we have demonstrated the construction of prototissues and also to make multivalent probes to decipher the interactions of parasites with red blood cells. We have demonstrated that changes in lectin architecture can give rise to new emergent properties upon interaction with protocells. For example, we have reengineered bacterial lectins and carbohydrate binding modules to make new hybrid “Janus-lectins” which have multiple binding selectivities. We have shown that these can be used to construct complex prototissues in which lectins with different binding selectivities can self-sort into segregated domains. We have also reengineered bacterial toxin lectins to create lectin clusters with different architectures that are capable of instigating membrane fusion processes. These innovations will open new lines of research for developing drug delivery systems and diagnostic tools that can be used to detect changes in glycosylation that are associated with specific diseases. Through this project we have established the nascent field of Synthetic Glycobiology. Further funding has been secured from the UK Royal Society to host an international conference on Synthetic Glycobiology in October 2018 to bring together diverse scientists working in this field from Europe, North America and Asia. Funding secured for a Marie-Sklodowska Curie Initial Training Network (synBIOcarb) is enabling us to expand our network to involve additional academic and industrial scientists with new and complementary expertise in analytical and diagnostic devices, parasitology and industrial know-how in commercial production of oligosaccharides, proteins with non-canonical amino acids, lectins and their industrial applications. Together, we aim to develop the emerging field of Synthetic Glycobiology from fundamental research toward practical applications in molecular diagnostics and targeted drug delivery.